On the left bank of the Ohio River at mile number 506.1 is nestled the early 19th century river hamlet, Rabbit Hash, Kentucky. It still looks much the same as it has for each preceding generation. This area of Boone County, Kentucky can trace its settlement as a rural community back to around 1813 when the Boone County Court issued its first ferry covenant bond to Edward Meeks for a ferry boat in this vicinity of the river. Since Kentucky's official boundary was the low water mark of the Ohio River on the opposite shore, any and all decisions, regulations, and permits concerning the Ohio River fell under Kentucky jurisdiction. Meeks Ferry was actually up river from Rabbit Hash, probably around the mouth of Middle Creek. It was established in order to transport people, livestock, and farm products across the river to the opposite shore of Rising Sun. The town of Rising Sun was laid out and established in 1814, while it was still a part of the North West Territory. Indiana didn't become a state until 1816. It was about this same time when travel and transportation of goods by the newly developed steamboat was beginning to come into its own. (Several years earlier, in 1811, the very first steamboat, the New Orleans, passed down this portion of the Ohio on its inaugural trip from Pittsburgh to Louisville, and then onto New Orleans.) It became necessary to provide a mode of physical communication between the Kentucky side and the Indiana side of the river as the two settlements extended and population grew. Economy and trade began to rely more and more on river transportation resources, and getting farm products to the steamboats and getting other goods off the steamboats was the business of this early river settlement area. An expansive sandbar on the Kentucky side of the river necessarily prohibited steamboats from being able to land there. Instead, they landed at Rising Sun where the channel was deeper and access was easier. These conditions made a ferry boat a necessity in order to conduct business. Goods for export were ferried across to the steamboats, and those imported were ferried back. Some residents continued the tried and true methods of transporting their farm products down river on their own flat boats and rafts, selling their goods as well as the boat at their destinations and returning by foot or steamboat. As the population increased and the yeoman way of life prospered, and river commerce and transportation progressed, more and more goods and products made their way down to the ferry landing. Eventually the need arose for a place to store these items while waiting for the steamboats to arrive. A group of local farmers got together and built a storehouse on the Rabbit Hash bank. This storehouse was managed and then eventually owned and operated by a single proprietor, James A. Wilson, at age 17 in 1831. 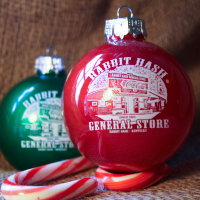 It has been in continuous operation ever since, with very little change, and has historically been known as the Rabbit Hash General Store. It was the winter of 1847 around Christmas time during very high water. It was very cold and an accumulation of snow covered the ground as a group of area residents peered out into the rapid running flood and watched buildings, livestock, lumber, trees, haystacks, and crops torrenting down the churning brown waters of the Ohio. As they were lamenting the great destruction and their losses, the topic turned to what each family would be serving for their holiday dinner. As everyone present took his turn, the main meat entrees included goose, a fat hen, fresh pork, and others. Finally there was but one left to give his contribution to the discussion. His name was Frank and he was the local comedian. As he looked around the landscape and watched as the flood waters drove all the low dwelling wildlife upland, he responded that it looked to him like there would be plenty of rabbit hash. His response eventually became his own nickname as the neighborhood referred to him as Rabbit Hash. Eventually that moniker attached itself to the small river hamlet and Rabbit Hash, Kentucky was born into Kentucky history. In the second and third quarter of the 19th century, most of the mail traveled up and down river by steamboat. Due to an ever growing frequency of mail destined for Carlton actually winding up in Carrolton, just 39 miles down river, the postal service asked Carlton residents to choose a new name for their post office. Since they had already called their town Rabbit Hash for years anyway, it was a no-brainer. Rabbit Hash, Kentucky was the official name of the town and it had its own post mark and post office to prove it. The famous historian Reuben Gold Thwaites, on his venture down the Ohio from Pittsburgh to New Orleans in 1894, mentioned in his published journal, Afloat on the Ohio, his stop at Rabbit Hash where he took advantage of the postal opportunities there to send out his mail. He also had the courtesy to leave us with photographic evidence of the Rabbit Hash General Store and the horse-powered ferry boat operating between Rabbit Hash and Rising Sun, Indiana. Rabbit Hash has two natural enemies, floods and ice. The serene, tranquil Ohio River has a tendency to occasionally forget its peaceful meanderings. When it does, it can become an unrelenting vicious monster bent on destruction and ruin. Half of the town of Rabbit Hash was severed from its Ohio River location by the 1937 flood as if a pencil eraser attacked a river map. Swoosh! Gone! So, why is the General Store still there? The '37 flood was not Rabbit Hash's first encounter with Mother Nature. Significant Ohio River floods occurred in 1849, 1883, 1884, 1913, and 1937 - each sequentially reaching a higher depth. The people of Rabbit Hash could take a hint. The local blacksmith in the 1880's devised a solution for the ever threatening problem. He designed and installed a series of threaded rods bolted on all four corners of the General Store between the bottom sill logs and top plate logs. Underneath the store, these rods have a hook. Another rod and hook system is anchored by concrete in the ground just below these rods. When flood waters rise and begin to float the store, these hooks engage and secure the building in place until the water subsides. There is still 1937 river mud in the attic of the General Store which attests to the efficiency of the protective system. It works so well that similar systems have been incorporated into the barn and museum buildings which are prone to flooding. The ice of 1918 did little significant damage to the town. But it was a rare spectacle to view and test. Photographic evidence proves the fact that cars and trucks did indeed drive across the Ohio between Rabbit Hash and Rising Sun in 1918, not to mention the scores of pedestrians taking advantage of the natural bridge. Rabbit Hash fared much better than Cincinnati and other major river cities which lost untold numbers of steamboats, landings, and warehouses to this destructive ice. What a perfect companion to the most deadly and devastating flu epidemic recorded in this are of the Ohio valley! In 1945, ice finally impacted Rabbit Hash negatively when it crushed and buried the last Rabbit Hash - Rising Sun ferry boat, the Mildred. Communication between the two towns ceased, except for people with their own watercraft. And the two towns grew farther and farther apart. In the earlier times, people from Rabbit Hash regularly frequented Rising Sun. They worked there, worshiped there, went to school and were buried there, shopped and doctored there. It was just like crossing the street. But this close interaction and relationship abruptly ended in 1945, and was even compounded by the raising of the river level in the 1960's. With the new system of navigational locks and dams, Rising Sun is now truly in another state, completely cut off from its former neighboring community. As the 1960s progressed into the late 1970s, Rabbit Has was literally "circling the drain." The convenience of automobile transportation and the establishment of trendy shopping complexes and malls were sounding the death knell for Rabbit Hash. The winter of 1978-79 was another river-ice year. Rabbit Hash suffered no losses or damage, but this was the ice that totally obliterated Big Bone Island downstream. Just like 1918, people walked over the ice from Rabbit Hash to Rising Sun, mainly just to say they did it. 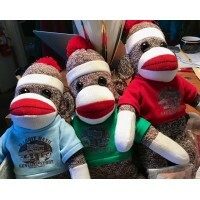 This was the winter Lib and Cliff Stephens decided they had had enough of the Rabbit Hash General Store. The town was dead and their business following suit. Louie Scott had already purchased the old Ryle Brothers Store from his uncle Clayton Ryle when Cliff offered him the General Store. After purchasing that property, he continued to purchase and collect piece by piece every other property which comprised the small 3.5 acre Ohio River town until he finally owned the entire town of Rabbit Hash. His reason? "It just needed to be saved." So, due to the efforts of a single individual, the town of Rabbit Hash was rescued from its path of demolition by neglect and given new life in its most recent revival. On December 13, 2002, Louie Scott sold the town of Rabbit Hash, Kentucky to the Rabbit Hash Historical Society for a nominal amount to insure its continued protection and preservation. A very generous donation of $250,000 bequeathed to the RHHS in 2001 by a local resident, Edna Flower, made the transaction and an endowment fund for the town possible. Rabbit Hash, Kentucky has employed many tools available to the preservation community. Locally in Boone County, it is a local landmark and has the only Historic Overlay zoning in the county. The General Store has been a Kentucky Landmark since the late 1970s. Nationally, the Rabbit Hash General Store has been on the National Register of Historic Places since the early 1980s, and in December 2003, the entire town of Rabbit Hash, Kentucky and 33 adjoining acres and contiguous properties were designated by the National Park Service and the Department of Interior a National Register District, only the second National Register District in Boone County, KY. In 2004, Rabbit Hash was honored as a Preserve America Community by Mrs. Laura Bush. Preserve America is a White House initiative developed in cooperation with the Advisory Council on Historic Preservations, the U.S. Department of Interior, and the U.S. Department of Commerce to highlight the efforts of the President and Mrs. Bush to preserve our national heritage. Over the past 25 years, there have been five different proprietors of the store, each adding his or her own local color to the latest Rabbit Hash revival, perpetuating its claim of continuous operation since 1831. 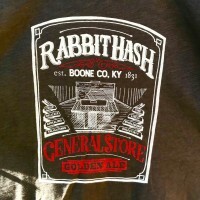 Rabbit Hash hats, shirts, and other souvenirs have made their way all over the world. The name is contagious. The place is therapeutic. Someone once commented that Rabbit Hash is not just a little river town, it's a state of mind. 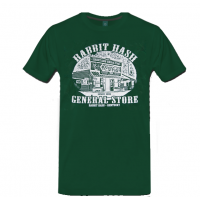 Rabbit Hash has its own meaning to everyone who lives there or visits it. But one thing is certain, Rabbit Hash is proud of its Boone County history and heritage and its legacy will be evident in Northern Kentucky for generations to come.